Now that the 2016 Olympic Games are over, Americans who own a television set are jonesing for more ways to see their favorite athletes. Stars like Simone Manuel, the Final Five U.S. women's gymnastics team, and Katie Ledecky made a huge impact this summer and most viewers aren't ready to say goodbye to them just. Those viewers are also likely missing the spectacle of the Olympics, however, that should be easy to find on TV thanks to the MTV Video Music Awards, which is one awards show that always brings spectacle. Since the 2016 ceremony is on Aug. 28, I'm hoping that Olympians like Simone Manuel will be at the VMAs so that we can see what they've been up to since they left Rio and continue to celebrate their achievements. Now, there is good and bad news. The good news is, many Olympians will attend the 2016 VMAs, as MTV announced that the Final Five and Michael Phelps will be presenters during the ceremony. The bad news is, those are currently the only Olympic athletes confirmed to be attending the show on Sunday night. There's always a chance that others could surprise fans by walking the red carpet and dancing in the crowd, so I'd be on the lookout when the VMAs air on Sunday night at 9 p.m. In the meantime, here's a breakdown of America's biggest Olympic stars and whether you should expect to see them at a very different kind of event. 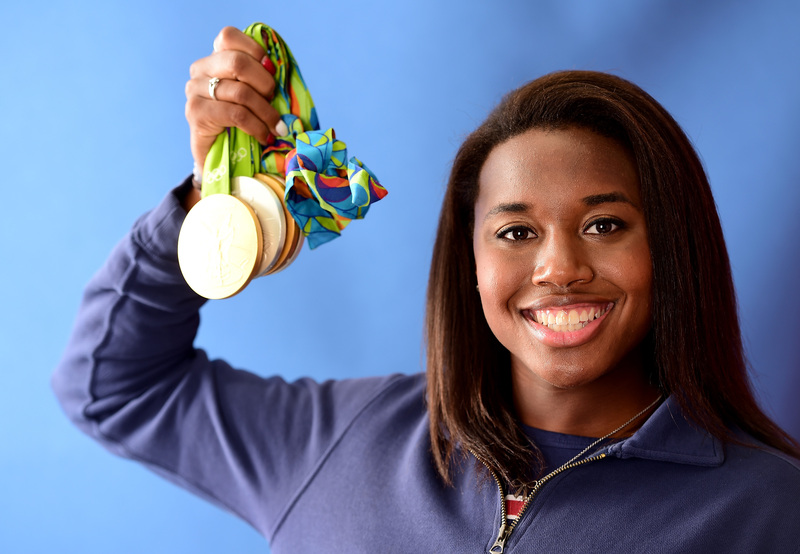 Manuel made waves in Rio as the first African-American woman to win an individual event in Olympic swimming. But will she be at the VMAs? She has not been announced as a presenter or attendee, however, there's a chance she could show up. After the Olympics, Manuel's Instagram mostly showed her spending time with her family in Texas, but on Aug. 27, she posted a photo from the U.S. Open, which just so happens to be held in New York... just like the VMAs. As part of the Final Five, Biles will definitely be at the VMAs as a presenter. Shortly after the Olympics ended, Biles told W that she was looking forward to getting back to "normal" life, watching Netflix, and lounging by her pool, but I'm glad she's taking a break from that (totally deserved) relaxation to have some fun at the VMAs. Hernandez will also present at the awards show and according to her Instagram, has spent the days leading up to the VMAs exploring New York City. Kocian has also been in New York for a little while and she shared a photo of the Final Five's appearance on The Tonight Show with Jimmy Fallon, so she's already used to being on TV outside of gymnastics. Raisman actually attended the 2012 VMAs with the Fierce Five gymnastics team, so presenting at the 2016 show should be no sweat. Like Raisman, Douglas already has VMAs experience and will attend the show for a second time on Sunday. Unlike the Final Five, Ledecky has not been announced as a VMAs presenter and her most recent Instagram photos show her at home in Washington, D.C. But hey, that's not too far from New York, so maybe the record-breaking swimmer and four-time gold medalist will make a surprise appearance. Thanks to the Final Five and Phelps, Olympians will be represented at the 2016 VMAs, but I'm hoping that even more of our favorite athletes will attend, because they all deserve to enjoy the excitement.